Tonight, as Egypt - Children Of The Revolution airs - filmed over a year through Egypt's revolution and tumultuous aftermath - two of the three young people we followed, Gigi and Ahmed, are back on the streets still fighting for the regime to "really" fall. The third, Tahir, an Islamist tortured in Mubarak's prisons is enjoying his party's first term in an uncertain parliament. What does it feel like to live through a revolution? That's what this film wanted to answer, by taking us away from the streets and protests and into the real lives of three young people who each wanted the revolution - but for very different reasons. The crew that worked on the programme across the year included a journalist, Inigo Gilmore, a Cairene ad-man turned revolutionary, Ayman Shabrawy and me, an Egyptian from Brum. Inigo started to film with Gigi and Ahmed when he met them on the encampment on Tahrir Square's roundabout during those first electric 18 days in 2011 which ended with the dramatic resignation of Hosni Mubarak. He had filmed with a view to following the story wherever it might lead - and we all knew that 18 days wasn't going to be the end of it. As for me, I wasn't in Egypt when the revolution started. Born to Egyptian parents in Birmingham, my family and I were glued to the coverage of our people ousting the very regime my parents had fled. When I stepped down off the plane in Cairo, in the ecstatic haze of the revolution's morning after, it was to follow up with Gigi and Ahmed on Inigo's request to look for a third character amongst the Islamists. This would be a challenge as the Islamists had been quiet on the revolution itself but we knew that they were going to become major players in whatever happened next. At the time it was incredible to be part of such optimism. The country was revolution crazy - one leading pizza store was even advertising 'democratic pizza' - where you could choose your own toppings. However, it didn't last. Filming in Egypt was extremely difficult. Egyptian state television stoked up fears of foreign forces at work to destroy the country. With Libya at war and Syria brutalised, there was a real anxiety that Egypt could end up with the fate of either. Distinguished by my British-sounding Arabic and wielding a camera and tripod, the team was mobbed several times by people convinced that we were, at worse Israeli spies filming state secrets, and at best, foreigners up to no good. So it wasn't altogether a pleasant ride. But who said revolutions are easy? Most of the time we had no idea what would happen next. Initially, what looked like a lull was the calm before the storm. At Tahrir Square, the revolutionaries constantly told me that the army would invade at any moment. Sometimes weeks would pass like that. We spent the year waiting, wanting to be there when it happened but also wanting to be away from the protests, inside living rooms, listening to the real conversations on the other side of town. At times, living through a revolution seems very ordinary - like Ahmed going to his barber the day after the fall of Mubarak. For me this year has been extraordinarily difficult - trying to film in a country where many people were scared of finding fault with the military, the last bastion of national pride and security. Where we were perceived to have an anti-military agenda we faced even more harassment, accused of being conspirators. The Maspero massacre that features prominently in the film, where army tanks ran over protestors in October 2011, was a very dangerous moment in Egypt. The nation was splitting and our film was trying to straddle the divide. Despite the negative events there is something overwhelmingly powerful about what I saw in Egypt this year - after 30 years of silence there is no way to turn to clock back - the price will be more deaths, but the prize is freedom. May Abdalla is the director of Egypt - Children Of The Revolution. 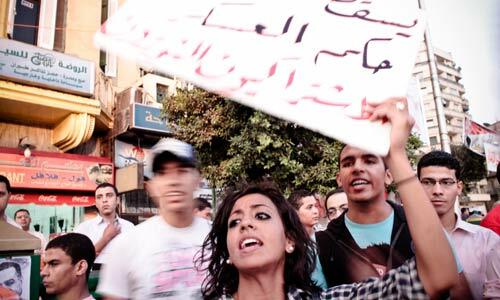 Egypt - Children Of The Revolution is on BBC Two and BBC HD at 7pm on Friday, 3 February. For further programme times please see the upcoming broadcasts page. I really enjoyed watching this. I thought that the portrayal of the different strands of the revolution was fascinating and gave the viewer quite a good picture of the varied social backgrounds and activism of the principal characters. The question I have is why was the political organisation of the Salafist and his beliefs clearly outlined while those of Gigi Ibrahim airbrushed from the film? The main reference to her ideas was the description by her father, and consequently she was presented as well meaning but driven simply by naive youthful enthusiasm. My understanding is that she is a prominent member of the Revolutionary Socialists organisation in Egypt. I feel that the film makers did her (and the viewers) a disservice by chosing to ignore the beliefs and motivations that guided her brave and inspiring activism. Because Gigi and her fantasy was never a reality, but a construct to develop the 'Arab Spring' narrative for mainly western audiences. Egypt is 'centrifugal' rather than 'centripetal' and the dominant forces will be anti-western...even Ennadha in Tunisia (the easiest) describes the 'westernisation' under Ben Ali as needing to be addressed. Gigi would 'western' in the eyes of Egyptians. Gigi has no relevance. Her 'Revolutionary Socialism' is nonsense (as it is everywhere). She has never been hungry. What I really liked about this documentary was that it was not just about the politics but it was about the personalities. What it was like to get caught up in something like this. Maybe there could have been a bit more about the different parties' plans for the nation but I liked the way this film wasn't really about that. It was much more powerful to hear things like Ahmed wondering how people would treat him now he'd been part of the revolution, or his mum worrying about whether or not she was going to be able to work, or Gigi whether she was going to be able to wear what she wanted at the beach. It brought it home what living through something like this must be like - on the one hand you might have big political opinions about how to run the country, but on the other you're just wondering what your own life is going to be like in a year. Gigi was a great person to follow because you could see how passionate she was about all this stuff but you could also see how it was something personal to her, something she was working out about herself as well as about the country. It was fascinating to see how her relationship with Mubarak and the established order was completely tangled up with her relationship with her father, and how her life was very much a product of the regime. It must be a hard one to work out. We got to see the human side of her not just the political side, which is so much more interesting I think. This was the worst documentary I have seen in the past 5 years; it was intentionally focused on exhibiting the negative aspects of the revolution. First, the programme focused on three extremist characters: the very rich, the very poor, and the very religious. Those represent less than 10% of the Egyptian people. It did not include the normal poor people, the Coptic Christians, the middle class, and the moderate conservatives (e.g. Muslim brotherhood). Second, the programme ended with a very gloomy picture for the future of Egypt, by closing the programme with a mile long trail of blood from one of the demonstrations. As I was in Cairo a month ago, I can easily tell that, aside from the confrontations at Tahrir Square, the rest of the country is still the same; life is going on elsewhere. Finally, the programme focused on all the messages of hatred and provocation between the classes of the Egyptian society. In one scene, an Egyptian child is shown saying that "The coptic Christians should be killed". In my view, this documentary was a big disaster. An excellent film. A very difficult, dynamic subject with the added problem of how to produce a film for the UK who will have their own ideas of Egypt & the revolution. Brave & insightful. Recommended. I thought this was a really eye-opening and engaging film. Fascinating to have a window into the daily experiences that play out alongside such seismic political events (the conversations in the barber shop, the arguments between father and daughter etc, the classroom debates). I was particularly moved when Ahmed's mum went down to join her son and the crowds in Tahrir Square, but was forced to remain at the edges of the square along with other women, and then taunted for looking like a 'beggar' as she sat on the street with her son. The film also serves to carry some important truths to a broader audience: about the torture and military trials of thousands of civilians, the Army's brutal suppression of protest, and the censorship by state TV. I also felt I understood a little better the very different visions for Egypt that are jostling for support. After almost losing hope with BBC 2, FINALLY along comes something decent - well told and without the sensationalism which has been creeping into the news recently. More like this please. A brave piece of film-making. So much more than a narrative about the inevitable triumph of the Muslim Brotherhood. Stories about individual lives will never paint the whole picture, but here were three characters that offered real insight into to the those aspects of the revolution rarely considered in the western media.